Hi my name is Keerthana, I’m the only daughter to my parents. Our’s is a family of three members myself, my father and my mother from Sri Kalahasthi, Chitoor District, Andhra Pradesh. My father name is Guravaiah aged about 36 years worked as Accountant, mother house wife and myself. Till few days back we were very happy and has a led beautiful life as normal as one middle class family do. But recently my mother was shocked to know that my father was attacked by a rare disease called Philadelphia Positive acute lymphoblastic leukemia (Type of Blood Cancer). I’m not sure how this will affect my father, but from my mother I came to know that the treatment needs lot of money that we cannot afford currently (approximately 26 lacks, estimated bill from the hospital is attached). My father is hospitalized since 1 month and we ran out of all our savings that my father did till today. I love my father very much and he is my best friend. It is really hard for me to imagine anything without my father. With my uncle help and suggestion I’m writing this letter to seek help from some kind-hearted people who could help my family by donating some money and saving my father. Pleasecirculate this in your contacts and kindly be a direct or indirect help to save my father and my family. Concern doctor is Mr. Yasir Jellani Samoon. Estimated cost for treatment is Rs.26 lakhs. 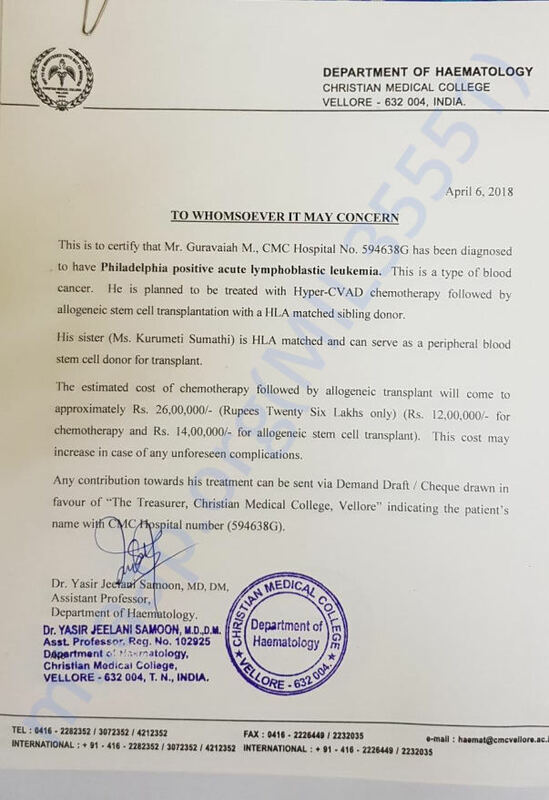 My father is suffering from Philadelphia positive acute lymphoblastic leukemia from Feb-18 on wards and admitted at CMC vellore and treatment was going on. Till now, he has completed 3 chemotherapy cycles and spent Rs 7 lakhs for the treatment. 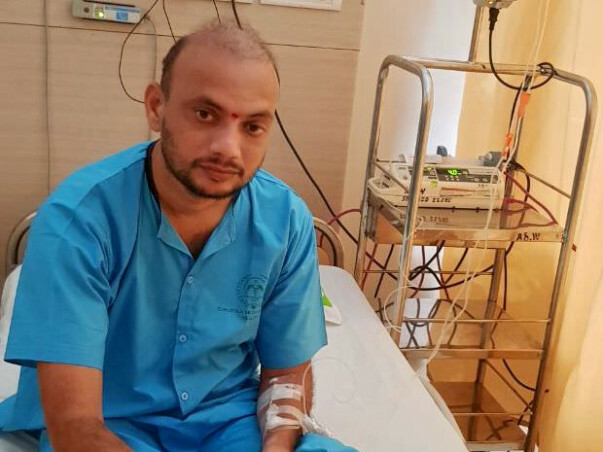 Doctors have suggested that he has to go for bone marrow transplantation which costing around Rs 14 lakhs. Please share this campaign among your family and friends, I am grateful to each one of you for your support. My father has completed 2 cycles of chemotherapy and he's been responding well so far. He'd be starting the third cycle of chemotherapy by tomorrow. Doctors have suggested that, once the third cycle is completed they will proceed to Bone Marrow Transplant depending on his condition and response. Thank you all for your support, we shall keep you all posted. Please keep him in your prayers.